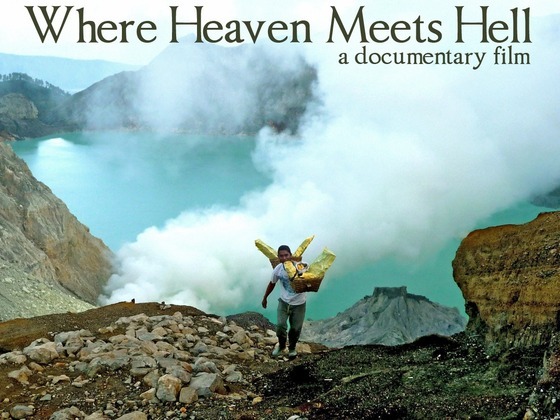 Kawah Ijen is an active 8530 feet tall volcano in East Java, Indonesia. Inside the crater is a 650 foot deep lake of sulfuric acid, the largest in the world. The temperature in the lake is 114 degree F. It is also the site of an intensive mining operation employing 200 miners who collect loads of pure sulfur which they haul by dual baskets balanced on a rod across their backs up the rocky 4 km path amidst the clouds of noxious sulfur dioxide gas. The company pays these laborers about $3 for 5 hours of work. Filmmaker Sasha Friedlander attended the graduate program of Social Documentary Film making at the School for Visual Arts in New York decided to tell the story on the plight of the miners as her film thesis. Having lived in Indonesia for two years and fluent in the language, she was able to have greater access to the lives of the miners for over a six month period. Following the stories of four of the workers she hopes to bring to light the health and safety issues they have to endure and hopefully to shed some awareness of the poverty that forces these young people to work in the crater to support their families. The film address the issue of inadequate medical care, safety precautions and education for the people in this area. So the next time you feel like complaining about your job, think again. The mine owner claims the work is simple and that it's not toxic. In fact you can eat it with no ill effect. However he asks his employee to eat it for the camera as he claims it might interact with some his medication. The miners are not only exposed to the gases and smoke that leads to chronic lung disease, but they must maneuver through hazardous terrain lugging 200 lbs of sulphur rock on their backs. The economy of the area makes it the only job choice for young men with out a high school certificate and with a family to feed. One man who was 59 has been working in the mine from the age of 14. Over the years he has managed to afford his family a decent house, and help his kids start a business, but the price of sacrifice is not lost on his children who worry about his health and safety. One young worker has ambitions to be a guide, practicing his language skills on the tourists that often visit the crater. When he is injured in a motorcycle accident, he had to stop working to recover. His co-workers hoped that he wasn't in the mines because he found his dream job. One of the miners keeps goats like a back up plan just in case of injury, or if his kids get sick. Selling his goats is like money stashed in the mattress. The miners backs are muscled and covered in calluses from carrying the loads. Their families are left alone for 15 day intervals while they work. The men worry if their family has enough food while they are gone. They worry about not fasting during Ramadan as they need the nourishment to keep working. Yet the people involved remain spiritual, resolved to their fate in life, making do with what they got and hanging on to the last bit of hope. The miners main concern in life is not only to feed their families, but to earn enough for their kids to go to school. The lack of education sets up a perpetual cycle of poverty which prevents their sons from following them to Kawah Ijen which they call hell. Being able to care of their families is what they call heaven.